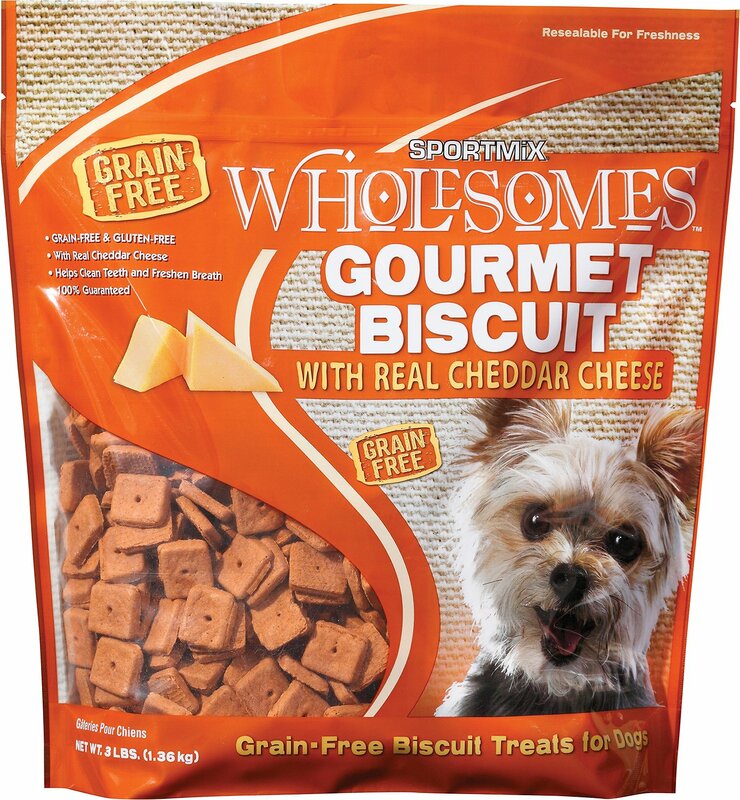 SPORTMiX Wholesomes Gourmet Biscuits are a great way to reward your pup while providing a delicious supplement to his diet. 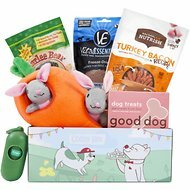 These grain-free and gluten-free treats are made with real cheddar cheese for a flavor dogs love and have a crunchy texture that helps remove plaque and tartar to support healthy gums. And you’ll be happy to know that every biscuit is naturally preserved and fortified with vitamins and minerals for an added boost of benefits! 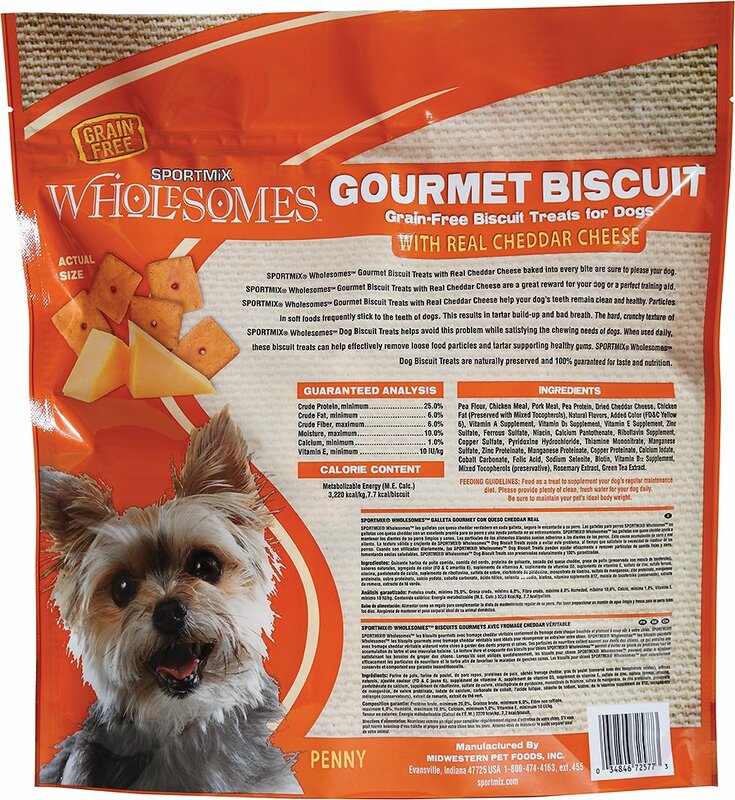 Made with chicken meal, pork meal and real cheddar cheese for a flavor your dog will go head over paws for. 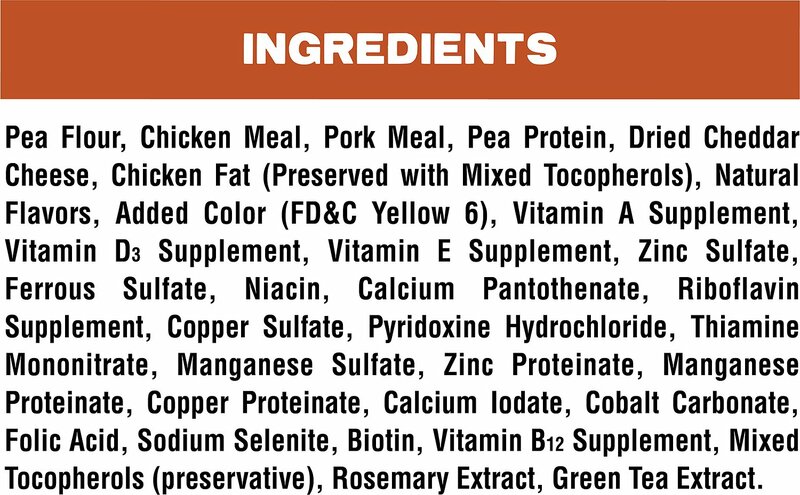 Pea Flour, Chicken Meal, Pork Meal, Pea Protein, Dried Cheddar Cheese, Chicken Fat (Preserved with Mixed Tocopherols), Natural Flavors, Added Color (FD&C Yellow 6) Vitamin A Supplement, Vitamin D3 Supplement, Vitamin E Supplement, Zinc Sulfate, Ferrous Sulfate, Niacin, Calcium Pantothenate, Riboflavin Supplement, Copper Sulfate, Pyridoxine Hydrochloride, Thiamine Mononitrate, Manganese Sulfate, Zinc Proteinate, Manganese Proteinate, Copper Proteinate, Calcium Iodate, Cobalt Carbonate, Folic Acid, Sodium Selinite, Biotin, Vitamin B12 Supplement, Mixed Tocopherols (preservative) Rosemary Extract, Green Tea Extract. With the ratings for these treats, I was VERY hopeful that I had finally found a treat my fussy dog would like. Nope. He LOVES plain white American cheese, so I thought these treats would be a big hit for him. And the price was very reasonable, too. So, I had high hopes. They were, again, dashed. He waited patiently while I opened the bag, knowing I had bought it for him, then reached over to sniff them while I made encouraging sounds. I perform this ritual so often, he knows something is coming his way. So, he sniffed, then walked away, again. I left it on the floor for him. I even tried again this morning. Nope. They still sit, uneaten, on the floor. These are not only a great value for treats that are USA made, but my girls love them! When you open the bag, the cheese aroma is evident & the drool starts flowing. 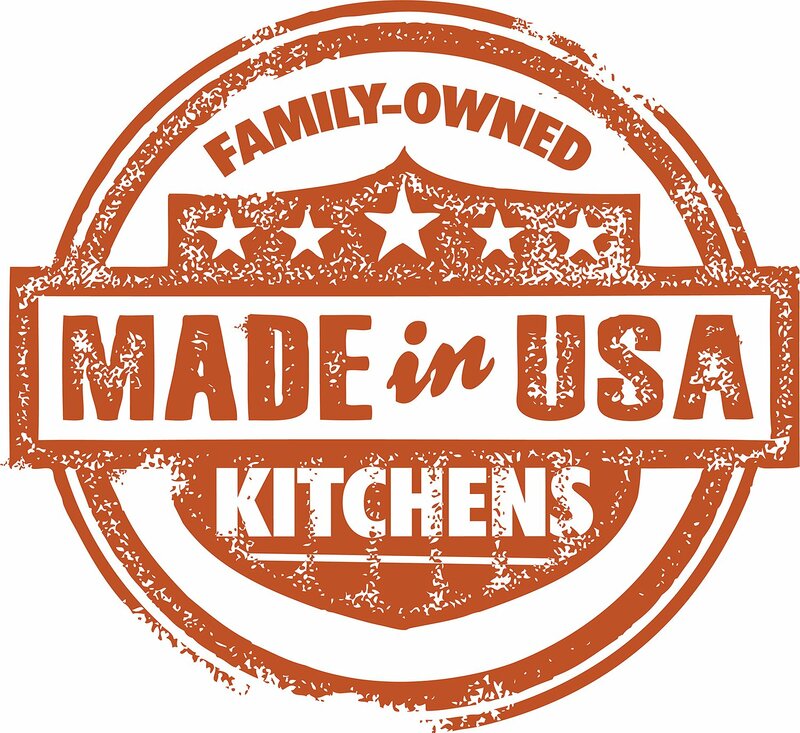 I’ve researched this company and have found that it has had no recalls on their dog treats and they actually get good reviews for all their dog biscuits. Thumbs up for a top notch, grain free, low calorie, great value, dog cookie! Great buy for grain free. 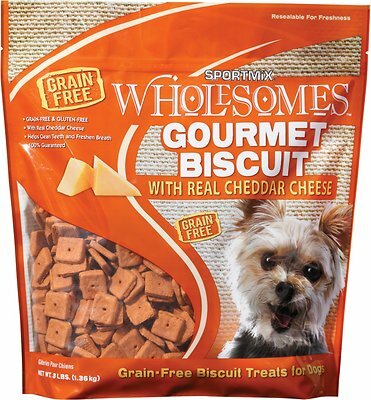 The dogs love it, the price is great for a grain free treat, and I like the size because it lasts longer than the big bones. 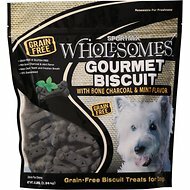 My dog ED love these treats...They are also very good for him. I use these as training rewards for my Corsos, they love them. These treats are a great value and they are grain free! My dogs love them.. great snack. Very happy with product. These treats are awesome. What a great value! Mickey and all his pals absolutely love them and you sure can't beat the price. Add to that the fact that they are grain-free and packed with nutrition and I don't see a downside. They even look appetizing, like one of my favorite snacks. In fact, I've had to stop my hand from reaching for a few for myself! I will definitely buy more of these. My dogs love these. I like them because they are grain free and just the right size. Good size for a small snack. Exactly the size of the human cheese snack. My dogs gobble them up!